This Application Note covers the basic structure and programming conventions of the MCode language, The differences between Lexium MCode and MDrive MCode is primarily found in the syntax of the I/O instructions. A Lexium MDrive Motion Control connected to power and communications. The examples below will not show every instruction example, just the most commonly used. An I/O instruction results in the change of parameters or the state of an input or output. The syntax for these commands are as follows: type the command then an equal sign, then the data. Example: O2=0 will set output 2 to 0. S<io point> Set I/O point type, active state and to sink or source S1=2,1,0 Set I/O 1 to be a Limit+ input, active when high, sinking. A Variable is identified by a mnemonic and allows the user to define or manipulate data. These can also be used with the math functions to manipulate data. There are two classes of variables: factory-defined and user-defined. There are 192 user program labels and variables available. The syntax for each variable may differ. Read/write – variables that may have their value altered by the user to effect events in a program. P (position counter) can be set i.e. P=0 or read, i.e PR P.
A (acceleration) can be changes as part of a move profile i.e. A=200000 steps/sec^2. Read only – Variables whose value cannot be modified by the user, but may be read or used to effect program events. V (velocity register the current velocity of the axis in steps/second. The first character must be alpha, the second may be alpha-numeric, i.e. K1, Ga, Z3 etc. HINT: The following Alpha characters are not used by any MCode command: G, K, X, Y or Z. A best practice is to name all user variables and program/subroutine labels with one of these alpha characters followed by a number. Global variables – global variables are variables that are defined outside of a program. The benefit t to using a global variable is that no user program memory is required. Local variables – this type of user defined variable is defined within a program and can only affect events within that program. It is stored in RAM. Note a local variable is not static, but is erased and declared again each time a program is executed. Keywords are used in conjunction with the PR and IP instructions to indicate or control variables and flags. For instance, PR UV would print the state of all the user-defined variables to the screen. IP would restore all the factory variables from the NVM. Math functions are used to perform various arithmetic functions on numeric data stored in registers or variables. Supported functions are +, -, x, ÷, >, <, =, ≤, ≥, AND, OR, XOR, NOT. For purposes of the following examples we will use registers R1-R4) and user variables labeled k1….kn for illustrating the use of math functions, though any variable may be used. Proper structuring of your MCode program will ensure your ability to work efficiently and will aid in trouble shooting your program. 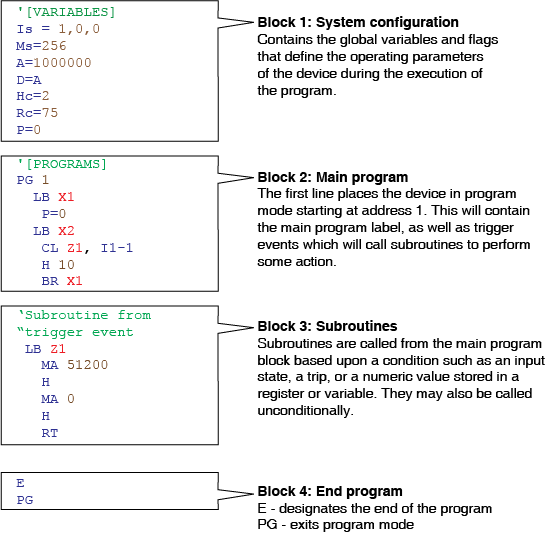 The figure below illustrates how your program can be blocked out to group the global system declarations, the main program body and the subroutines. Here is a simple program that, when executed, perform a move and print the position. Once entered, from immediate mode enter “EX G1” to run the program.